Facebook released today a brand new (separate) app, called Facebook Messenger for the iPhone and Android devices. 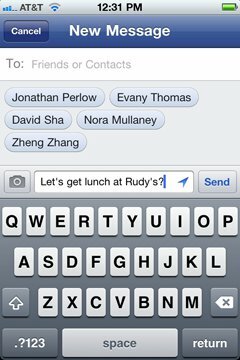 It combines all of your messages into a single app and can be used to text your Facebook buddies via your profile or text message, via your carrier. Also 9to5Mac have uncovered that the app (both for the iPhone and Android) has a top-secret video component to it, which would mean that the Palo Alto-based company is on route to rub shoulders with Skype (among others) by bringing cross-platform video calls. Facebook Messenger aims to give you a better way of reaching your friends and contacts by unifying your entire correspondence with everyone (social network friends, email and phone contacts) into one single app. 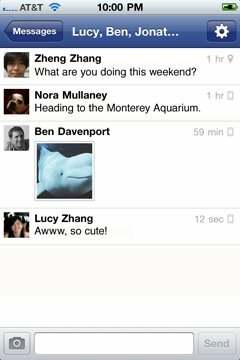 The Facebook Messenger is an extension of the Facebook messages service and you can send messages to your online friends, but you can also send texts to your acquaintances the regular SMS way. Starting up the app brings you to a list, consisting of all your Facebook messages. 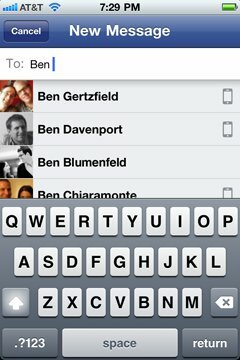 To write a message to someone you just tap the compose icon in the top right corner and start typing the person’s name. If a person has more than one number to his/hers contact details the app prompts you to select which number to use. You can, naturally, just select Facebook messages and send an online message. There’s added support for group conversations and a geo-tag option so you could let people know where you are. This all looks swell and okay, but I just have to ask – iMessage anyone? It does look similar to the Facebook Messenger and add all the other details to the lot and it could easily step on Viber, WhatsApp, Tango and other services’ shoes. It seems a little underhandedly done by the big blue social network leader. But I guess in today’s technologically social times competition is tough, ruthless and has no regard for integrity. Have any thoughts on the matter? Share them in the comments – we’d love to get your inputs. Here are some direct download links to the apps – iTunes and Android. So far only the iPhone is listed as an iOS-supported device so iPad and iPod Touch users will have to wait a while longer. Facebook has put up an official page for the new service – check it out here.